RESEARCH TRIANGLE PARK, NC — Recognizing employers that encourage cultures that welcome and support all workers, Forbes magazine has included RTI International, a nonprofit research institute, among its 2019 list of America’s Best Employers for Diversity. RTI ranked at #359 out of 500 companies independently surveyed from a large sample of U.S. companies and employees representing 24 of America’s leading industries in Forbes’ second year of its annual list. To create the survey list, Forbes worked with Statista, a market research company, to survey more than 50,000 U.S. employees working for companies employing at least 1,000 people in their U.S. operations. The survey was conducted using an online access panel, providing a representative sample of the U.S. workforce from all industry sectors (Government Services excluded). The overall evaluation was based on four different criteria: Direct recommendations; Indirect recommendations; Diversity among top executives/board; and Diversity Key Performance Indicators (KPIs). Direct and Indirect recommendations included questions relating to gender, ethnicity, LGBTQ+, age, disability and some general questions. The percentage of women among top executives and board directors was indicative of diversity among top executives/board. Diversity KPIs included an index based on the management position for the executive responsible for the company’s diversity and an index based on proactive communications of a company’s diverse culture. Respondents identified their organizations by name and rated them in an open-ended question. After computation, the 500 companies receiving the highest total scores were awarded as the Best Employers for Diversity 2019. 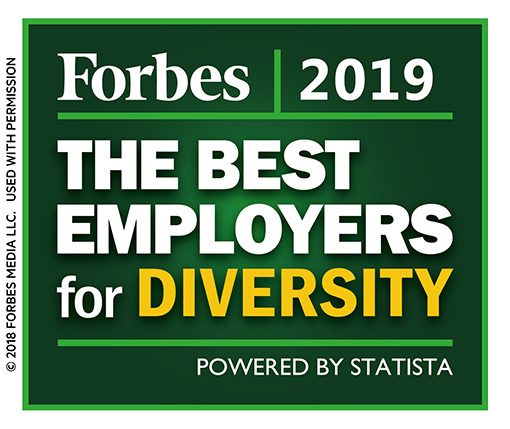 The entire list of 2019 employers recognized in the survey as America’s best employers for diversity is available here. Learn more about diversity and inclusion at RTI and discover the RTI difference here.